The northwestern corner of the wood and the crest of the ridge are covered by a deposit of sand and gravel of Mid-Pleistocene (Cromerian to Ipswichian) age that is about 400,000 – 1 million years bp. The deposits were laid down by flood waters of glacial rivers during a period of climatic amelioration between glaciations. Examination of the pebbles on Sharphill will reveal many from quite distant sources, possibly from Lancashire, Cheshire, Wales or even Scotland. Glacial deposits, the Thrussington Member Diamicton (Boulder Clay) lie just to the northeast of Sharphill in Edwalton. These are Anglian in age dating from about 450,000 years ago. Head deposits are formed more recently, by rainwater washing soil, sand and gravel down the slopes of the hills. The bedrock that outcrops in Sharphill Woods is assigned to the Branscombe Mudstone Formation (formerly called the Cropwell Bishop Formation). About 10 metres of the Formation cap Sharphill and consist of red-brown mudstone and siltstone, with common grey-green patches that result from reduction of the red iron minerals. In the lower part of the formation there are sporadic thin beds of clayey sandstone and silty dolomite, formerly known as “skerries” They are more resistant to erosion than the enclosing mudstone and give rise to ridge lines such as at Sharphill. A thin bed or “skerry” is shown on the geological map; it is roughly horizontal and cut by faults that trend in a NW-SE direction. Beds, nodules and veins of gypsum are common in these beds and are mined throughout Nottinghamshire, as at Barrow and East Leake. Nottingham alabaster (gypsum) was mined from as early as the Middle Ages and was used throughout Europe for religious carvings and church decoration. The Branscombe Mudstone rests on top of the Arden Sandstone Formationthat is about 10 metres thick. Formerly called the Hollygate Skerry, the formation consists of grey, green and purple mudstones interbedded with paler grey-green to buff or brown siltstones and sandstones; beds of conglomerate occur locally. Below the Arden Sandstone Formation lie the red-brown and greenish grey mudstone and siltstone of the Edwalton Member of the Sidmouth Mudstone Formation. The red mudstones include beds of indurated, variably dolomitic siltstone and very fine-grained sandstone (skerries) and gypsum. The Edwalton Member is 35 to 45 metres thick. These Triassic deposits were all formed in a hot desert environment that was periodically or seasonally inundated by the rivers that traversed it. One might imagine a scene similar to that around the lakes of the Australian deserts. The sandstones and siltstones commonly show signs of contemporary disturbance by burrowing creatures and may show ripple structures generated by water transport of the material. Thicker sandstone units have an internal bedding structure and a lenticular shapes that indicate that these rocks were formed by rivers depositing sand and gravel in broad channels. Fine sand, silt and clay would have been deposited when of floods burst the river banks carrying sediments onto the alluvial plain where peat would also have accumulated in shallow bogs. The gypsum would have been deposited following the drying out of salty transient lakes. 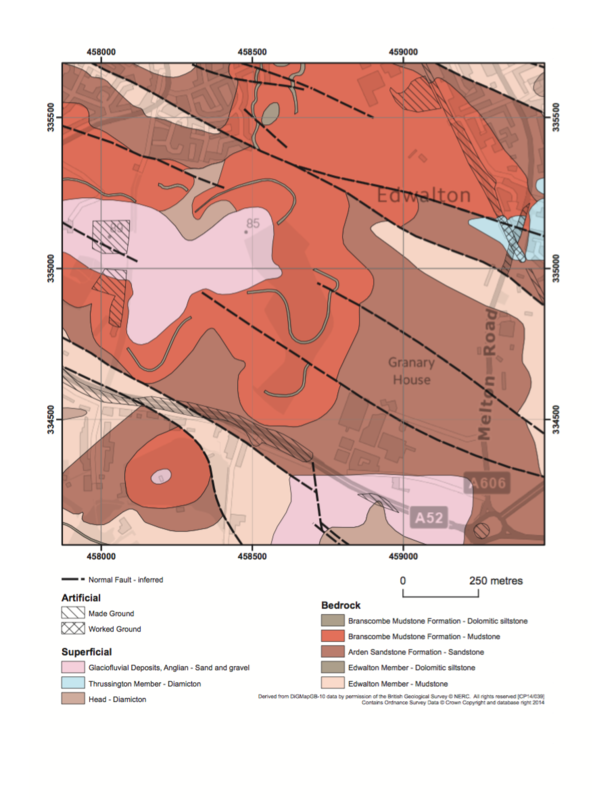 Older mudstone and sandstone deposits of Triassic and Permian age (The Gunthorpe Member, mudstone, Tarporly Siltstone, formerly called the Waterstones, the Nottingham Castle Sandstone and the Lenton Sandstone Formation) underlie the formations seen around Sharphill. At greater depth lies the Pennine Middle Coal Measures Formation that includes the coal seams mined throughout Nottinghamshire. The Piper Seam, for example, lies at about 310m below and the Deep Soft about 270m below the surface at Sharphill. The seams were worked between 1961 and 1968. As mentioned above geological faults are shown to cut the strata at Sharphill although they are relatively minor in effect. The faults may have been inferred at surface from their more precisely known and mapped positions in the mine workings.